Tercer Edad means Third Age. Spanish cultures divide life into three ages, childhood, adulthood, and the rest of life. For us, it means a chance to explore and learn new things, working less and traveling more, making new friends and deepening relationships with old ones. Some of our travels are in our 1999 Pleasure-Way camper van, which means -- egad -- we're officially RV'ers. We closed on our new house on Monday and received all the keys from the seller, who flew into México City from San Antonio. He and his cousin, who lives in México City, drove to Pátzcuaro for the closing and then went back immediately afterward. The wire transfer of funds occurred while we were in the notario's office, so there were no hang-ups there, and we read through--slowly--the Spanish of the draft escritura (deed), picking up a few typos and other minor errors that were corrected before we signed. Like most legal documents, there were large sections of obvious boilerplate that we could pretty much ignore, and only a few places where we had to make sure our names were spelled correctly, that our passport and permiso numbers were correct, and that the property description was accurate. Unlike US legal descriptions that use precise measurements and survey data, the description for this house was based on the names of owners of the adjacent properties -- "to the north, 40 meters with Elvira Luna Domínguez, to the east, 20 meters with Domingo Alcalá," etc. It may seem a little unusual, but this is how they do it here, and it seems to work. As our friend Lon said, it's the walls around the property that are the real boundaries. In many ways it feels a little anticlimactic, after all the anticipation. But after the house sitters leave for Canada on May 1 we'll have plenty of opportunity before we also leave to spend time in the house getting a feel for it. As Mark said, we've spent more time buying a used car than we did looking at this house. But we're both confident that we're going to enjoy the house very much. 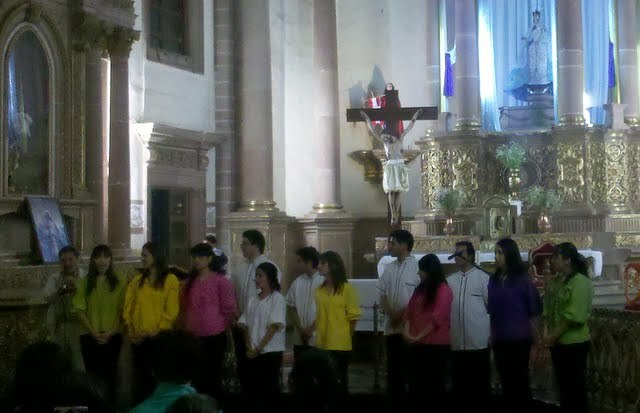 And if you're curious about what happened during Semana Santa (Holy Week) in Pátzcuaro, we'll try to get caught up soon. It was quite eventful and we observed or participated in most of it, though we did opt out of Sunday night's "Burning of Judas." We saw the spectacular fireworks from our rental house, but we missed the excitement of Judas' fireworks-stuffed body burning and exploding to the delight of the crowds. Like most fireworks displays in Latin countries, there is little effort made toward "crowd safety," shall we say. Fireworks are ignited in the middle of the crowd, and the residue rains down on everyone. But as far as I know, no one has been seriously injured by this practice, and it does make things pretty darned exciting. Lon mentioned buscapiés, literally "search for feet"--fireworks that run around the ground. His partner Santiago remembers a time when he was a kid in Guadalajara one got under a priest's robe to the great amusement of the onlookers. Maybe next year for us. 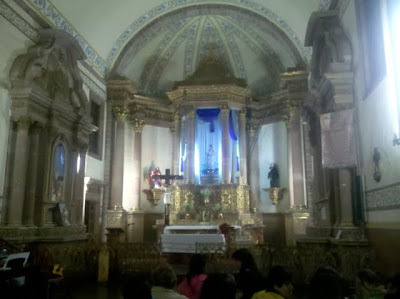 Our friend Tracy has photos and brief descriptions of the Semana Santa activities at her wonderful blog Patzcuareando: Peripatetic in Patzcuaro. As for the trip home, we plan to leave May 9, and estimate it should take 4 or 5 days. With the rainy season approaching in June, the air here has been pretty smoky as farmers burn off their fields in preparation for another growing season. It will be nice to get back to our Colorado valley with its 100-mile visibility and distant, crystal-clear vistas. Over the years, as we've driven around México, we've fantasized about buying a house somewhere. We've never found the right place until now, though all along we knew it wouldn't be anyplace on the beach. Over the past month or so we've talked to realtors, looked at houses to rebuild or remodel, looked at empty lots and talked to a builder, and looked at finished houses. Are we crazy? Probably. In late February we looked at a very nice house in our neighborhood recently built by a woman who unfortunately passed away within a year from the cancer that had plagued her most of her life. We agreed that it was a beautiful, well built house with lots of windows and sun and patios and portals and fountains, completely furnished, on a large open lot. The price, however, was out of our comfort range, so we filed it away in the "impossible" category. The person who showed us the house indicated that the heirs would consider an offer, so we made one that we could live with, both feeling that if it was accepted we'd be happy, but if it was rejected it wouldn't break our hearts. Well, our offer was accepted, and we're part way through the process of buying it. We have a signed contract and deposit, and last week went into Morelia with a bilingual friend who's been through the process of applying for permisos. While ex-pats can own property in most of México without having to use a bank trust (fideicomiso), we still have to get permission from the government. Our permisos were ready the next day, record time probably because the office isn't processing many requests. Between the stagnant US real estate market, dismal economy, and general press hysteria about all things Mexican, there are few foreign buyers. Next was a visit to the notario, who prepares the deed (escritura) and makes sure that there are no outstanding liens on the property (like unpaid water bills) and that the title is clear. He represents the government and has no allegiance to either the buyer or the seller. We will close on April 25 at noon. It's an understatement to say that we're both delighted and slightly terrified. We looked at each other and said, "If not now, when? We're not getting any younger, and the time to do this is now." We're not blind to the difficulties here. The narco-wars in the northern states are horrible, and while this area is relatively tranquil, we've no illusions about the corruption, extortion and bribery that saddle local businesses at a time when tourism is suffering badly. Air pollution, trash, noise and congestion are daily occurrences that we deal with. So are fabulous free classical and jazz concerts, movies, dance performances and museums and galleries, and an abundance of wonderful foods in the mercado. The Mexican people are warm and gentle, and we think we have much to learn from them. After much discussion, we think the rewards outweigh the risks. We have no idea what this means for our future. Do we stay as snowbirds, part-timing it for the winter and then going back to Colorado for the summer? Summer is the perfect time in Salida, after all, but the old farmhouse is hardly a "lock-and-leave" affair. We'd like to experience the summer rainy season here, when the countryside turns from drab tan to brilliant green. We have no answers right now--we're feeling our way in the dark, quite frankly. At least for the near future we will be part-timers, but we both believe that there's no time like the present, and why not try something new? Click here for photos of the house. On a recent Sunday morning, as we were finishing a leisurely breakfast on the Plaza Grande with our friend Roberta Smith, who was visiting from Salida, we heard music. A group of women and girls, festively dressed in brightly-colored embroidered blouses and aprons, danced toward us to the accompaniment of a small band. The ages ranged from early 20s down to girls of 5 or 6. Like most small bands here, there was a tuba, an enthusiastic drummer, someone playing cymbals, and a couple of trumpets and clarinets. A crowd gathered around the edges to watch the dancers, including one where young women took turns dancing around a torito (little bull), wielded by young men and boys. Someone passed the hat and the crowd contributed, and then the band led the dancers to the Plaza Chica, where they would dance again. This little fiesta was to celebrate San José, whom we would call St. Joseph. The next day, Monday, was Benito Juárez's birthday, and a national holiday. He was born a poor Zapotec Indian in a small village north of Oaxaca, with no prospects other than a life of poverty and manual labor. He walked many miles to Oaxaca in order to go to school even though he didn't speak Spanish, and found work in the home where his sister worked as a cook. His intelligence and interest in learning attracted the attention of a priest who encouraged him to pursue an education. He became México's first indigenous president, serving 5 terms (1858-1872) and leading the reforms that began the creation of modern México. His portrait is on the 20-peso note. Some more photos and a video from Sunday. The amount and variety of free musical concerts in the area has been one of the highlights of our time here. Unfortunately, they're not usually well advertised and when they are, are often opaque in their description. So when we saw a small blurb on a poster for the "Ensamble Musical de la Universidad Vasco de Quiroga Campus Morelia," we had no idea what the "ensamble" would consist of -- chamber orchestra, string quartet, or ??. The event was part of a week-long celebration commemorating the 446th anniversary of the death of Don Vasco de Quiroga in 1565. Don Vasco was the visionary Spanish bishop, jurist and protector of the Indians in this region of Mexico. Heavily influenced by Thomas More's 1515 book Utopia, he set about organizing indigenous communities here along Utopian principals, and his influence is still apparent today as villages retain craft specialties established hundreds of years ago. Nancy was nursing an irritated throat last evening, so I walked the five minutes to the Templo del Sagrario, encountering my friend Bernard coming out of his house along the way. Begun in 1693 and completed 200 years later, it's probably the most photographed building in Pátzcuaro. The windowed wall, old stone and general gravitas speak of its history. The church has the original wood parquet floors, simple wood pews, and is far less grandiose than the Basílica two blocks away. There were also a few pieces done by a choral workshop group, but they did not measure up to the quality of the university choir, so I'm not presenting them here. The celebration for Don Vasco de Quiroga continues with a play on Saturday night, a dance performance by the Pátzcuaro Folklóric Group on Sunday (always colorful and spirited), and a concert by the Young Persons' Chamber Orchestra of Michoacán on Monday at the Basílica. The orchestra consists of the best young musicians in the state between the ages of 11 and 32. All events are free and a continuing tribute to the tremendous government support for the arts in Mexico. What a difference from the slash-and-burn-the-arts wrecking crew currently at work in the U.S. Congress. Every place celebrates Fat Tuesday in its own way. Today we learned how Pátzcuaro does it, though other towns around the lake have completely different traditions. This morning, on the way to the studio, I encountered a parade of children from various schools with their own version of a torito, or "little bull." Mexican children are totally adorable, and when they're marching in a parade they're especially cute. Each school had its own miniature bull accompanied by students in costume. The adult celebration involves elaborate costumes and masks--all men in drag--and a much larger torito, which is a paper mache bull's head with real horns, a red paper tongue hanging out, and a paper mache body. The man underneath spins and bucks and dances to the music of a small band. These are made in outlying colonias (neighborhoods) and there's a lot of drinking that goes on throughout the day. The torito dancer changes over time based on fatigue and alcohol consumption. Doesn't the guy on the left look familiar? As we were in town this evening we saw large unruly groups of semi-sober celebrants coming down the hills toward the plaza with their toritos. When 2 groups are in the same place there's a mock confrontation between the bulls, with a lot of yelling and cheering and loud music, and a cohete (rocket) or 2 as punctuation. Men circulate to collect money from the crowd, and I guess that as the night goes on and the amount of booze increases there are fights among the groups. Here's a link to a short YouTube video of the "bullfight." All last week we kept seeing what looked like colored eggs being sold in the market and on the street. Today we learned what they are--dyed eggshells filled with confetti,that are meant to be cracked on the heads of your friends and fellow celebrants. I watched little kids mash the eggshells over their parents' heads and giggle as the confetti spilled down. Everyone in the plaza this morning had confetti in their hair and the ground was peppered with broken eggshells and colorful dots. We bought some to bring home, so watch out--someday you could have confetti in your hair too! Tomorrow is Ash Wednesday and everyone will be somber (and maybe sober), but tonight the party goes on. Last Tuesday we drove with Eileen and Bernard Wasow to Tzintzuntzan, a nearby town where a multi-day celebration of El Señor del Rescate (rescate means "rescue") was culminating in a significant fiesta complete with bands, craft vendors, and food. The churchyard in Tzintzuntzan was full of people, and along the road we encountered many peregrinos (pilgrims) making the trip on foot from Pátzcuaro. As we got closer the numbers increased. Many people begin in the early morning because it's a multi-hour walk. Even little kids and their grandparents were hoofing it along the road. Tzintzuntzan means "place of hummingbirds" in Purépecha, the local native language, and may refer to the sound that hummers make. It's one of the serious craft villages around the lake, with several distinctive ceramic styles, including a green glaze that I find oddly attractive. Unfortunately these are low-fired ceramics, which means they are not lead free. Some potters in Capula, another craft village, are now making vessels sin plomo, but most can't afford to invest in the high-temperature kilns needed for lead-free glazes. Tzintzuntzan is also known for its straw crafts and stone carvers. We parked the Sube in a lot near town and walked the remainder of the way. There was a long line of combis on the edge of town, and I assume that there were equally long lines on the other entry roads, waiting to take people home at the end of the day. The road into town was lined with stalls selling food (every time there is a crowd in Mexico there will be food vendors), ball caps, rugs, pottery, sweets, fruit cups, and special bread, among many other things. On the way back to the car we bought one of these breads, which were being baked on the spot in hot gas ovens. The churchyard is intimately associated with Bishop Vasco de Quiroga, who established his first base here in the mid-1530s before moving it to Pátzcuaro a few years later. Tzintzuntzan was also capital of the Purépechan empire, never conquered by the nearby Aztecs despite their best efforts. Quiroga is said to have planted the first olive trees in the New World in this churchyard, some of which still exist though their venerable trunks are hollow and too feeble to produce many leaves, much less olives. On ordinary days the churchyard is serene and peaceful, but this was no ordinary day. Many stones in the churchyard and buildings were taken from the Purépecha sites that the Spanish demolished. There were 2 big castillos in the churchyard ready to be ignited that night, and 2 quite excellent bands that alternated throughout the day. I was amused to hear a familiar Mozart composition scored for brass band with drums and cymbals. Nicely played, though. A steady stream of pilgrims entered the church, many on their knees carrying candles. I saw a group of young women whose friends were placing pads in front of them to cushion their knees as they approached the door of the church. A family with young children came out carrying a photo of El Señor del Rescate that they pressed to each child's forehead before the husband and wife kissed it and crossed themselves. The church itself was richly decorated with banners and beautiful floral arrangements throughout, on altars and overhead, and along the walls. Adjacent to the church, in another area of the yard, was a procession of young girls and boys dressed as kings and queens, with white robes, scarlet capes and gold and silver crowns. They walked and danced continuously, shaking golden rattles, as a small band played a repetitive tune on strings and guitar and a group of grotesquely-masked figures in black danced around them, apparently tempting and tormenting them. This continued for 20 or 30 minutes, raising a cloud of dust (it's the dry season here). Here's a video I recorded of the virginal boys and girls and their devilish tempters. Many vendors displayed piles of lemons, called lima﻿s (limes are called limones). We think limas are bland and tasteless, though some people like them for lemonade because you don't need to add sugar. After a few hours we had seen enough and eaten enough carnitas (delicious roast pork rolled in hot tortillas with sauce and pickled vegetables, sold by a man enthusiastically wielding a cleaver), so we walked to the car to drive back to Pátzcuaro. Many families had settled in for the day, eating and visiting and enjoying their holiday. On the way home there were still groups of peregrinos along the road, heading to the churchyard and the fiesta, though by then it had gotten pretty hot. Here are a few more photos from that afternoon. This morning, as I was engaged in my daily struggle with the new litho process I've been working on, the mezcal dude showed up at the print studio. I'd been told that he comes on Tuesdays and Fridays, but until now I hadn't seen him. He had a big white sack over his shoulder, kinda like Santa Claus, with a large plastic container and a length of plastic tubing inside. Mezcal is 70 pesos a liter (approximately a quart), bring your own bottle. Total cost--$5.83 at the current exchange rate. I didn't have a bottle with me, but Julian (one of the studio gang) emptied a Ciel water bottle into the pan they use to make coffee and handed it to me. I gave my 70 pesos to the mezcal man and he siphoned a liter of clear liquid into the bottle. I tucked it into my bag, thanked him, and he went on his way. Julian says it's good mezcal, and having just tasted it we agree. The last time we bought mezcal it was 30 pesos a liter (including the container) in the Oaxaca region, so the price has gone up, at least around here--though this includes delivery. ﻿ Mezcal is similar to tequila but is made from a different type of agave, and because it's distilled over a wood fire in small batches it tastes smokey. We bought our mezcal in Oaxaca from a family with small production, one fermentation vat, and a crude copper still. Those little places were everywhere in the countryside, mostly on back roads. If you went from one to another, with each one eager for you to sample their product, you would probably be unsafe to drive. Many people prefer mezcal to tequila because they say it's more "natural" and less "chemical." I don't get that because the way I understand how tequila is made (and we've visited distilleries in Tequila), there are no chemicals added to the mixture. The agave is roasted or steamed, crushed, fermented in large vats, and then distilled one or more times. It's sold as blanco (white) or plata (silver) which is bottled immediately after distillation and which tastes most strongly of the cooked agave; resposado (rested), which is aged for up to a year in oak casks; and añejo, which is aged up to five years. The longer the tequila stays in the oak, the less it tastes of the agave and the smoother it is. We personally prefer the peppery sweetness of the blanco. The next step--mezcal margaritas, in honor of the late, great Bob Howell of Rincon de Guayabitos, Nayarit. Although he was a tequila man, his margaritas and love of Mexico inspired a generation of folks with similar passions, including us.